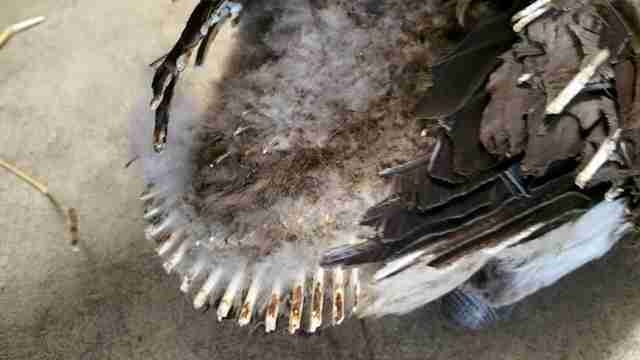 In an extraordinary display of parental devotion, one very dedicated goose offers further proof that a mother's instinct can transcend that of survival itself - by sacrificing her own body to save her babies. Wildlife specialist Tim White was dropping off some paperwork at his office in Erie County, Ohio, on Sunday when he saw smoke rising near one corner of the building. 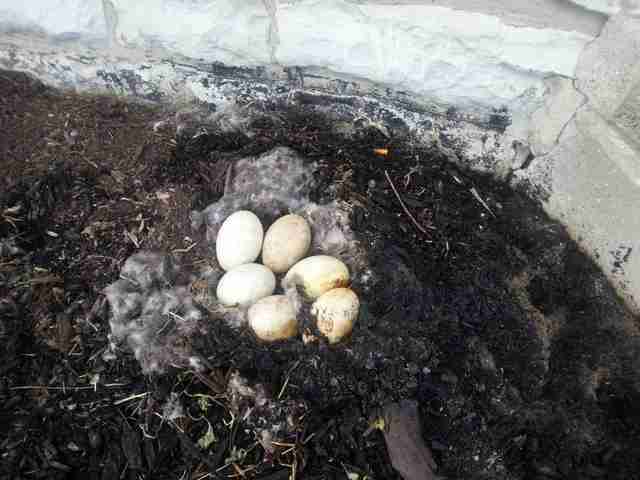 Hurrying to investigate, White discovered a Canadian goose on the ground holding steadfast in the middle of a fire that had engulfed her nest containing six eggs, reports the Sandusky Register. "It was a small blaze, but she was sitting right in it," White told The Dodo. "She took the brunt of it. 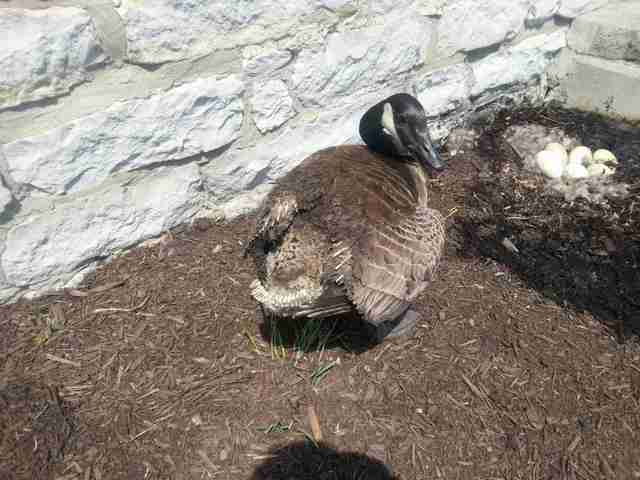 She was sitting on the eggs just trying to protect them." Even as White rushed to fetch buckets to douse the flames, the mother goose never budged, despite the fact that her feathers had been scorched and singed in the blaze. "She probably would have sat there until she was deceased," said White. Once the fire was out, White made a troubling find, leading authorities to believe the fire was no accident. At the base of the now-ashen nest were several cigarette butts which, White said, appeared to have been placed there intentionally. White called the sheriff and rehabilitators from Back To The Wild animal clinic to collect the bird and her unhatched babies. 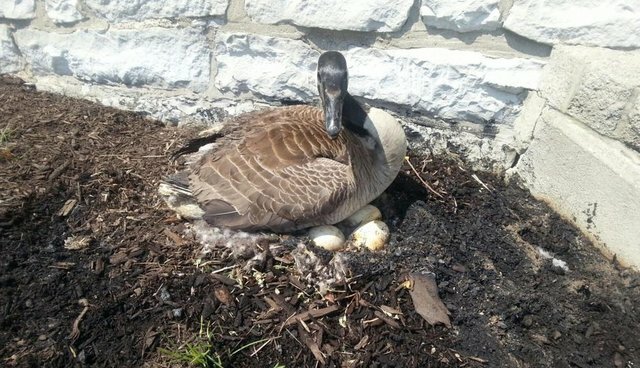 Aside from having damaged flight and tail feathers as a result of the fire, the mother goose is said to be doing well and is expected to recover. Although several of the eggs were visibly burned and none may still be viable, rescuers at the clinic say the least they can do for mom is give them a fighting chance. "We're keeping them in an incubator just in case," staffer Sammie Zilla told The Dodo. 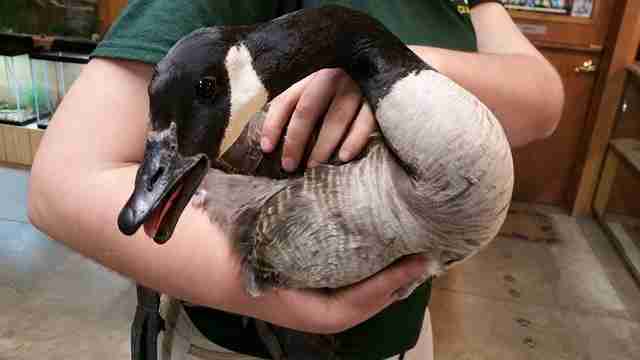 "If they do end up hatching, they'll go back with mom and we'll let her take care of her babies here, and then they'll all be released together." Among those hoping that the devoted mother goose will one day soon be able to meet the babies she fought so hard to save is the person who was fortunate enough to find her in time. "There's too many bad endings out there," said White. "I hope this story has a good one."